The Waukegan Public Library has a long history of distinguished service in Waukegan. The library as we know it today was preceded by several operating systems, the first being the Little Fort Reading Room and Library Association founded on November 24, 1845. Each member paid twenty-five cents per quarter support fee. Along with this fee, members were able to place a book into the library for others to check out. Over one hundred and fifty books were collected and housed in the Court House. Unfortunately, twelve years later, the library was destroyed when the Courthouse burned down on October 27, 1857.
established. These women were looking to bring to fruition a free library. People laughed at the idea of Waukegan maintaining a free library, but the Sesame Club members responded, “It must and will come.” Citizens, club and board members donated books to the Library Association, and the library was open on Thursday and Saturday of every week from November 1895 to 1896. The Club then took steps to convince city officials to provide support for the library through a tax-supported system. In June of 1898, the city accepted the library and its effects as a gift from the Library Association and on November 1, 1898, a tax-supported Waukegan Public Library became a reality. In 1899, Mr. Oliver Lincoln willed property on Washington Street at Sheridan Road to the city to be used as a park. In 1901, the Lincoln heirs provided a conveyance granting the city the right to erect “upon said remised a library building or buildings.” A Board member of the then-existing Library Association appealed to Mr. Andrew Carnegie for funds. Mr. Carnegie responded with $25,000.00 “if the city of Waukegan would furnish a suitable site and through Council agree to $2,500.00 a year support of said library.” The proposal was accepted and a stone building of Ionian Greek style architecture was constructed. This building served the community as a library for sixty-two years. During a period in the 1930’s the library opened and operated three branches—one located at McAlister and May Streets in the Lyons Building; another at Washington and Elmwood Avenue in the Hutchison Building; and a third at Grand and Yeoman Street in the Yeoman Building. The old Carnegie building was viewed with affection by the citizens of Waukegan until after the Second World War when it became evident that crowded conditions were limiting the expansion of library services required by a rapidly growing city. The first bookmobile was then put into operation in April of 1956; a second bookmobile was added to the extension system in June of 1962. The League of Women Voters was responsible for the formation of a Friends of the Waukegan Public Library organization on January 29, 1963. The $1,125,000.00 bond issue for a new library building was passed on April 27, 1963. 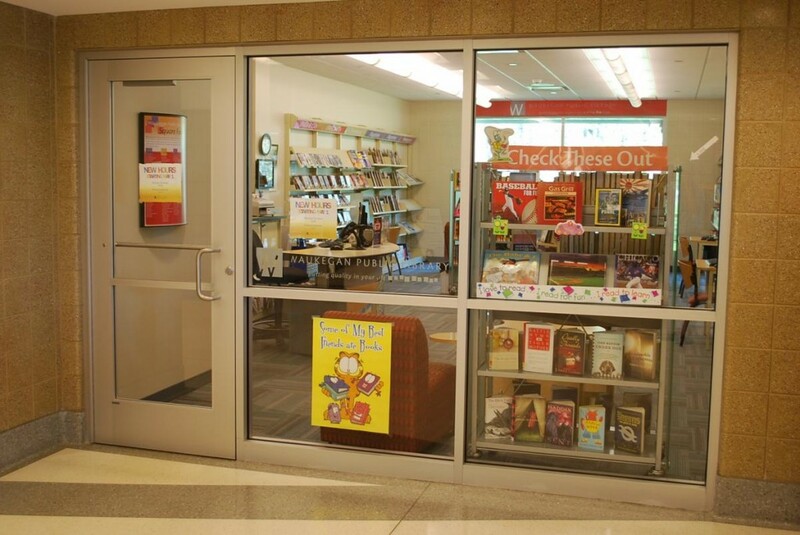 Major credit for the passage of the bond issue went to the League and the Friends of the Waukegan Public Library. Waukegan’s current library building is located at County and Clayton Streets and is part of a governmental complex including both municipal and county buildings. It was designed by William Ganster of the Waukegan architecture firm of Ganster and Henninghausen. The library opened for service on December 27, 1965 and was dedicated on April 19, 1966. A major renovation project was completed in 1998 which added 16,000 square feet of public space without moving or adding on to the current building. The lower level was refinished to house the children’s department, two new story/craft rooms, an audio/visual browsing room, a Friends of the library used book sale room, and the Ray Bradbury Meeting Room. In 2005 the library evaluated the needs of its patrons in the western part of the city. 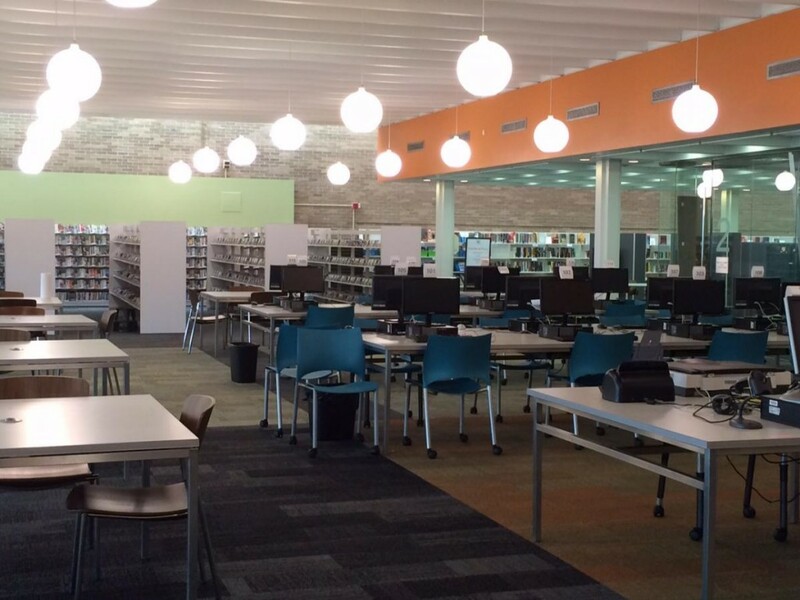 A decision was made to build a branch to accommodate those patrons in the western areas of Waukegan and make it convenient for them to utilize library services. In 2006 the 203 square foot Hinkston Park Branch opened, located in the Hinkston Park Field House at 800 North Baldwin Avenue, Waukegan. Total construction costs to open this branch were $90,000; $33,000 of that amount was fundraised. 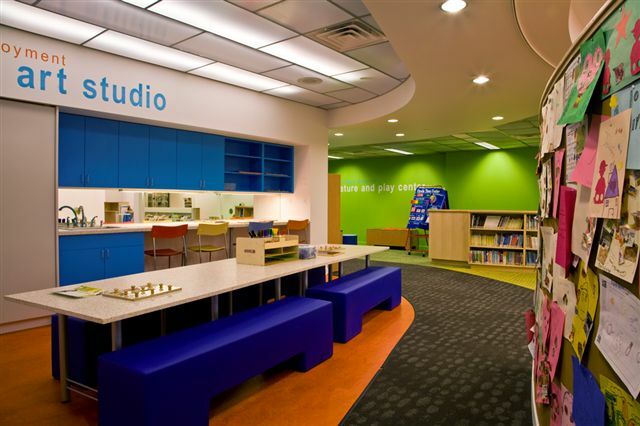 Two years later the library repurposed 2,200 square feet in the Children’s Department to build an Early Learning Center. The concept for the center sprang from a 2006 United Way survey that showed only 43% of Waukegan kindergartners ever attended preschool, and 77% speak Spanish as their primary language. Over half the kids surveyed had little or no exposure to books before entering public school. The Early Learning Center is a cutting-edge facility featuring interactive, bilingual displays and programs geared towards children ages 0-7 and their families. It focuses on the development of pre-literacy and literacy skills so all children in Waukegan will be better prepared to become successful students. Total cost of the project: $310,000. Dollars fundraised for the project: $225,525. Portions of the lower level were renovated again in 2009 to create the Literacy Suite, a 3,200 square-foot space which offers free one-on-one tutoring for adults who wish to improve basic reading or writing skills, plus free group classes, including Adult Basic Education, Family Literacy, and computer classes in Spanish and English. Total cost of the Literacy Suite $67,000; total dollars fundraised for project: $67,000. The Friends of the Waukegan Public Library and the Friends’ Used Book Sale space were moved to the main level of the library at this time. 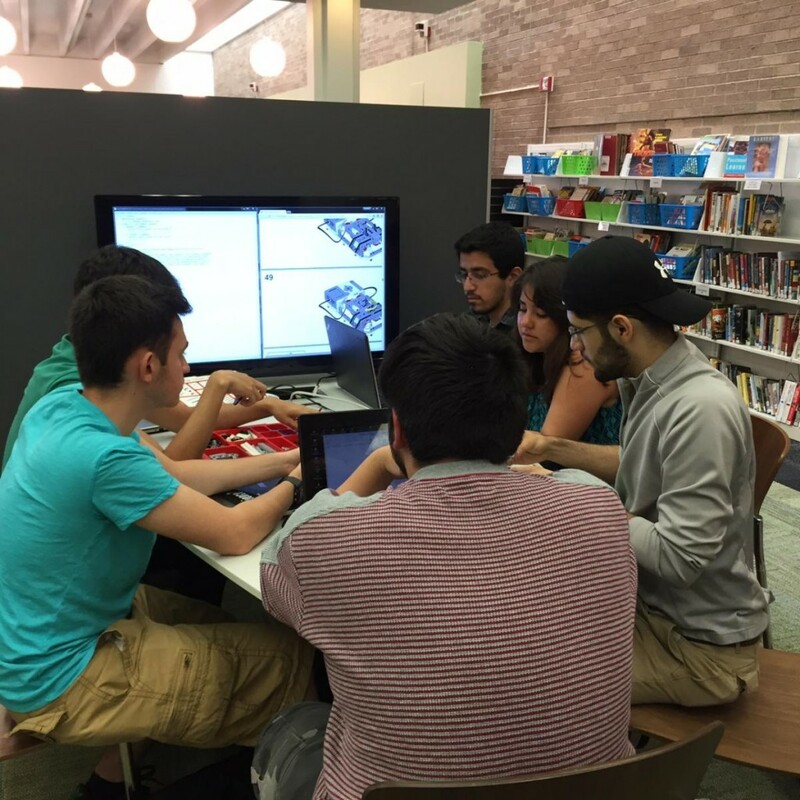 The Library’s 2015 renovation completely transformed the main floor into a learning-focused library space ready to meet the needs of its patrons by creating spaces for collaboration and quiet study and increasing the number of classrooms. Study rooms are soundproofed and glassed-in, creating privacy but allowing for natural light. The digital media collection is housed next to the Friends’ Book Sale, and the print collection now features an updated shelving configuration. New seating and tables provide increased workspace, as well as integrated power connections for laptops and digital devices. Additionally, the Library added a new cafe space, with hot coffee and tea, to foster collegiality. In June 2015, the reconfigured main floor also reintroduced the Library’s art exhibitions. A central meeting room features a movable wall enabling it to divide easily into two classrooms, and the new floor plan also features several open group workstations. The workstations, found just around the corner from the study rooms and opposite the Friends’ Book Sale, provide comfortable seating for five, with flatscreens enabling patrons to link up their laptops and collaborate. The Library’s official grand re-opening occurred on June 12 and 13, 2015, with an evening gala and daytime ribbon cutting. In 2018, in response to a dedicated effort to develop and implement new programs and services for young adults, the Library created The Corner, a space for teens on the main floor featuring modular furniture, engaging, interactive displays, and highlights of the YA collection. Learn more about The Corner here. The upper level of the Library houses administration, extension services and management of the collection.